NETWORK UPDATE: CBS benefited from afternoon adjustments, as SURVIVOR climbed 0.2 to 2.5, and both CRIMINAL MINDS and CSI: CYBER rose 0.1. In addition, there were 0.1 bumps for THE MIDDLE and THE GOLDBERGS, as well as THE VOICE. (None, however, for AMERICAN IDOL.) The ARROW rerun on CW lost 0.1. Discovery’s DUAL SURVIVAL was again at the top of Wednesday cable, up 0.04 to 0.72, with lead-out SURVIVORMAN BIGFOOT down 0.01 to 0.37. TLC’s MY 600-LB LIFE was up a hefty (sorry) 0.18 to 0.60. CATFISH (MTV) dropped 0.09 to 0.58. Lifetime’s LITTLE WOMEN LA: TERRA’S LITTLE FAMILY premiered at twin 0.58s, with an episode of LITTLE WOMEN NY following them, up a tick to 0.42, and a LITTLE WOMEN special to start the night at 0.34. WORKAHOLICS (Comedy Central) gained 0.06 to 0.55, and BIG TIME IN HOLLYWOOD FL rose a hundredth to 0.27. On A&E, STORAGE WARS was at 0.53/0.51, up more than a tenth from last week, and SHIPPING WARS was up 0.07 to 0.38. ABCFamily’s YOUNG & HUNGRY rose 0.07 to 0.41, and FREAK OUT gained 0.04 to 0.13. THE AMERICANS (FX) rose a much-needed tenth to 0.35. 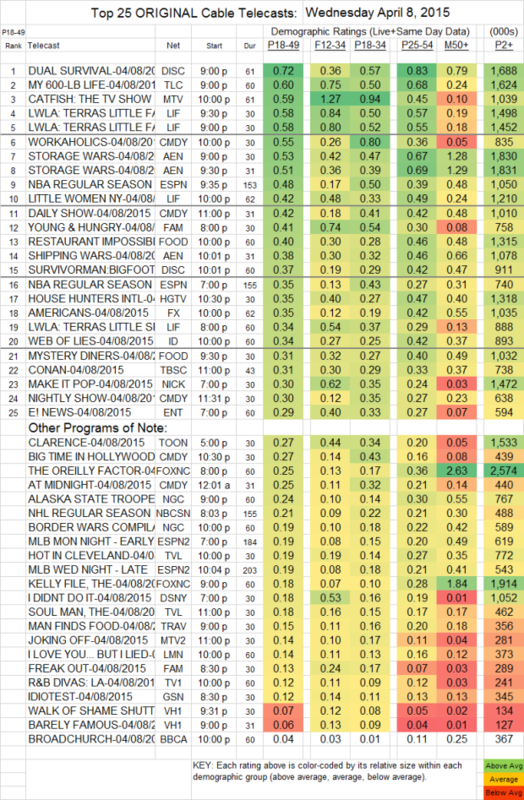 On TV Land, both HOT IN CLEVELAND and SOUL MAN were up 0.2, to a respective 0.19 and 0.18. VH1’s HOT GRITS doesn’t seem to have aired last night, but WALK OF SHAME SHUTTLE and BARELY FAMOUS each gained 0.02, to 0.07 and 0.06. BROADCHURCH (BBCAmerica) remained at 0.04.